On the night of June 11, Shaykh-ul-Islam Dr Muhammad Tahir-ul-Qadri delivered his special address on the Masnavi of Maulana Rum (R.A) to the participants of Itikaf City under the banner of Minhaj-ul-Quran International (MQI). 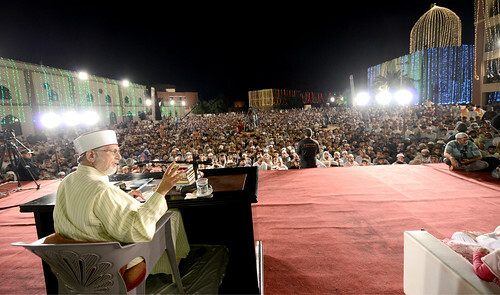 Thousands of male and female participants listened to his address, which was also broadcast live via Minhaj.TV. On the night of June 10, Shaykh-ul-Islam Dr Muhammad Tahir-ul-Qadri delivered his special address on the Masnavi of Maulana Rum (R.A) to the participants of Itikaf City under the banner of Minhaj-ul-Quran International (MQI). Thousands of male and female participants listened to his address, which was also broadcast live via Minhaj.TV. Addressing a Friday congregation at Itikaf City, Dr Hassan Mohi-ud-Din Qadri, Chairman of the MQI Supreme Council, has said that as long as extremism and radicalism continue to exist, wishing terrorism and militancy away will be an illusion. He said that the state of Pakistan will have to eradicate the menace of extremism through curriculum reforms and winning over the battles of hearts and minds. The founding leader of MQI, Dr Muhammad Tahir-ul-Qadri has said that repentance is the first step for the travellers on the path of truth. He said that Allah Almighty has ordained His subjects to stay away from the path of evil. He said that prostrating before Allah Almighty with the resolve to stay away from sins is a form of penance. As cleanliness and purity is the first step for worshippers, likewise for those traveling on the path of truth, repentance is the first step forward in the journey. Shaykh-ul-Islam Dr Muhammad Tahir-ul-Qadri has said that tolerance and moderation are the distinctive attributes of the Muslim school of thought and construction of an ideal society is not possible in terms of character by ignoring these excellent human Islamic values. He said that saving the Muslim Umma from factionalism and keeping it united is the religious and moral duty of the religious scholars. Minhaj-ul-Quran Publications has set up its bookstall and sale centre at Itikaf City like the previous years where published works and books of Shaykh-ul-Islam Dr Muhammad Tahir-ul-Qadri are available on 50% discount rate. The new books of Shaykh-ul-Islam published in recent months are also on display for sale. The largest Itikaf gathering after the one held at Two Holy Mosques continues with traditional fervor in Township Lahore under the banner of Minhaj-ul-Quran International. In addition to daily special lectures of Shaykh-ul-Islam Dr Muhammad Tahir-ul-Qadri, an educational intellectual sitting is held every day on various jurisprudential and religious issues for the participants of Itikaf City in which Mufti Abdul Qayyum Khan Hazarvi replies to the questions of the people in a very lucid and easy-to-understand manner. MQI Secretary General Khurram Nawaz Gandapur, who is also head of the central committee responsible for arrangements at the Itikaf City 2018, visited the site of Itikaf and reviewed arrangements on the occasion, Jawad Hamid, the Secretary of Itikaf Committee, briefed the MQI Secretary General on the arrangements for the participants of Itikaf City. The city of repentance, rectification of deeds, purification of soul, understanding of Deen, known by the name of Itikaf City, has been established with thousands of the faithful participating in it in the company of Shaykh-ul-Islam Dr. Muhammad Tahir-ul-Qadri. All is set for Minhaj-ul-Quran International’s Itikaf City to be established from tomorrow (Tuesday) onwards in Jamia al-Minhaj, Township, Lahore. Thousands of men and women from across the country will become the residents of Itikaf City from the 20th of Ramadan till sighting of moon in the company of Shaykh-ul-Islam Dr Muhammad Tahir-ul-Qadri. Hundreds of people have started to arrive from abroad to take part in the Itikaf. MQI’s Itikaf City has a unique and distinguished importance in connection with developing understanding of religion and self-purification. The process of registration has got underway and those who want to attend the Itikaf 2018 should contact the district and zonal office holders for registration. 26th Itikaf City of Minhaj-ul-Quran International came to end after sighting of the moon on June 25, 2017. Shaykh-ul-Islam Dr Muhammad Tahir-ul-Qadri led tearful Dua in the Itikaf City, a place for understanding of religion, reformation, repentance and self-improvement. The residents of Itikaf City were weeping as Shaykh-ul-Islam made Dua. A comprehensive manifesto in the form of the Holy Quran was gifted to the mankind on the Night of Power for its salvation. Creation of Pakistan and completion of revelation of the Holy Quran are two great gifts of the blessed Night of Power. Humanity can regain lost peace and tranquility by treading the path indicated by the Prophet of Islam (PBUH). Dr Muhammad Tahir-ul-Qadri, the founding leader of MQI, stated this while delivering his special address at the annual International Spiritual Gathering held on the intervening night of the 26th and 27th of Ramazan here at the Itikaf City in Lahore. Continuing with his special lectures on morality and good conduct at Itikaf City here in Township, Lahore, the founding leader of MQI Shaykh-ul-Islam Dr Muhammad Tahir-ul-Qadri has said that standing up to oppressor in aid of the oppressed is also part of excellent conduct. He said that if softness in individual matters is important, of equal importance is standing up to oppressors for collective good of the society. He said that one of the miracles of the Holy Quran is that sounds of its text also determine their meaning. Continuing his special lectures on the topic of morality, the founding leader of MQI Dr Muhammad Tahir-ul-Qadri has said that every age leaves its impact on knowledge and research of that era. He said that religious scholars have protected religious values in every age, adding that those who safeguard the religious values in this day and age marked by mischief deserve to be congratulated. Shaykh-ul-Islam Dr. Muhammad Tahir-ul-Qadri especially participated in the Iftar transmission Pak TV on the 22nd of Ramazan under the title of “The Guest of Shaykh-ul-Islam”. While talking with the host of the programme Muhammad Usama Ghazi, he said that in his view the service of humanity was the worship and Deen. He added that the sole aim of his life was to love the humanity, spread the happiness among the poor, and benefit the people without any discrimination of caste, colour and creed. While addressing the thousands of residents of Itikaf City 2017 at Jamy al-Minhaj, Dr Muhammad Tahir-ul-Qadri has said that Allah Almighty perfected the morality of the Holy Prophet (peace and blessings be upon him) and rendered it into a complete code of conduct for humanity. He said that morality is the most sublime virtue in all the attributes of man. He said that the Holy Prophet (peace and blessings be upon him) is the best both in terms of his creation and morality. While addressing the residents of Itikaf City here at Jamy al-Minhaj, MQI founding leader Shaykh-ul-Islam Dr Muhammad Tahir-ul-Qadri has said that the spiritual influence of ten special nights of Itikaf should keep us overwhelmed for the rest of the year. He picked up the subject of martyrdom of Hazrat Ali Murtaza (RA) for his keynote address and said that love for Sayyiduna Ali Murtaza (RA) is part of our faith He said that remembering the Caliph of Islam is an act of worship.